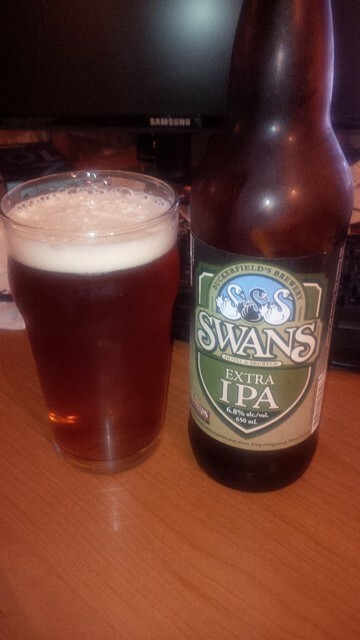 From Swans Buckerfields Brewery in Victoria BC comes their “Extra IPA”. This India Pale Ale pours a copper colour with an off white head. The aroma is of tropical fruits, fruit, citrus and floral hops. The flavour consists of pine, resin and hops bitterness up front with tropical fruit, citrus, grapefruit and malts following. The alcohol content of this brew is 6.8%. This is an awesome IPA and I am glad I not only had it at the brewpub but also picked up a bottle! Commercial Description: A strong hoppy ale. Brewed specifically for the hop lover. A blend of hops, prized for their aroma, gives this beer it’s great hop bouquet and lasting hop flavour. This entry was posted in India Pale Ale and tagged bc, beer, bitter, bitterness, buckerfields, canada, citrus, grapefruit, hopped, hops, hopy, india pale ale, IPA, malt, malts, malty, pine, resin, swans brewpub, tropical fruit, tropical fruits, victoria.